In the previous pAsuram, it was mentioned that in his younger days, whether he was tied down by a rope or by a snake, he would protect his devotees. In this pAsuram, it mentions about the way he protected the pANdavas after emperumAn had grown up. sUdhaRiyA nenjamE – Oh heart which does not know the means! Not knowing that engaging with matters related to emperumAn is good and that these should be held on to or that engaging with other matters is bad and that they should be desisted from. thollaikkaN mAththAnaikkellAm Or aivaraiyE mArAgak kAththAnai – Against huge armies which made the earth to suffer, emperumAn (as krishNa) made the five pANdavas as the opponents and protected them. 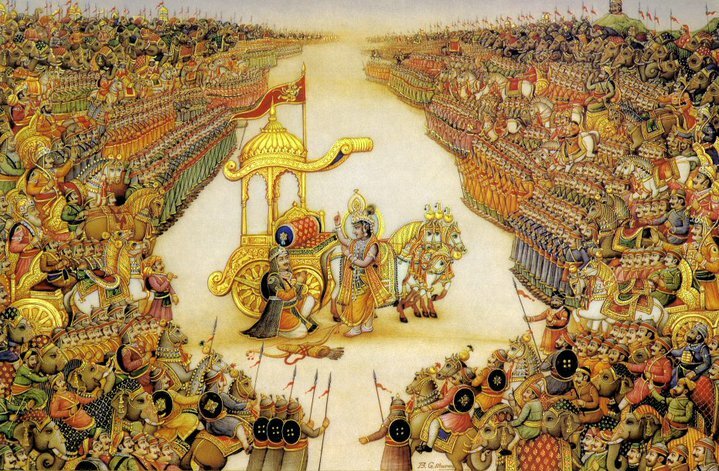 If emperumAn had himself destroyed dhuryOdhana et al, the pANdavas would not have recognised that as their victory. Hence, he put them up in the front and made them victorious, protecting them all the time. ellip pagal ennAdhu eppOdhum kAththAnai – though the pANdavas waged in battle during day hours and slept during the night hours, emperumAn, without distinction between day and night, kept himself awake fully, massaging arjuna’s shoulders, devising the means which will enable pANdavas to become victorious, putting them into practice and protecting them. kANdum nI kAN – if you desire to see (AzhwAr tells his heart), you can see truthfully. We will go on to the 20th pAsuram next. This entry was posted in iyaRpA, periya thiruvandhAdhi on October 25, 2018 by T N Krishnan.